I have a customer that call out a Solid State relay and i cannot find any information on it. Can you help? It is a SP-646. I need a quote on 60 and 120 pieces. The SP646 is a bi-directional, single-pole, single-throw, normally open multipurpose relay. The circuit is composed of one LED on the input side which activates an optically coupled IC on the output - controlling the firing angle of two back-to-back SCRs. This circuit assures no false triggering under most adverse conditions, and a tight zero-volt window not exceeding 5V. The SP646 Data Sheet includes the Complete Overview, Electrical Characteristics, and Schematic Diagrams. Even if you dont find the same number, Digikey or Mouser may have an Equivalent. Just match the Electrical Specs and PCB Footprint, pitch etc. 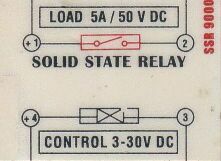 Solid State Relays - They are called SSR as there are made of semiconductors and have no moving parts to wear out. They do generate heat depending on load and switching. Thyristors are used in most as they are rugged, mosfets and IGBT may also be used for various applications.